Summer holidays are on the horizon. Some parents are anticipating them with glee; balmy evenings spent flying kites on the beach with the whole family. You find these people on Pinterest and on stock photos- they are often wearing white and every child has brushed hair. Other parents are looking at the approaching school holidays with a sense of great doom. Edvard Munch’s The Scream is more the image that comes to mind. In this parent’s summer the sky is on fire, hands are raised to the face in an expression part horror, part extreme boredom. And there’s not a kid in sight – lost, every single one of them. As a homeschooling mom I only know when school vacations happen because my Facebook feed gets filled with parents asking what the jeff they are meant to do with their kids every day for the next 60 days. Being at home with my kids day in and day out, though, does mean I have a LOAD of ideas for activities that pass the “Time Input by Parent x Time Spent on Activity By Kid” equation. The ultimate summer bucket list is comprised of these kinds of activities. Ones that can be set up quickly and inexpensively that keep children occupied for hours. Lots of these activities capture the imagination and end up evolving into games all of themselves. Find a tree and a small area you have permission to dig up, in your yard or a friend’s yard, perhaps. (Try to avoid the local golf club/prize winning rose gardens.) Dig up a bucket of mud, add a little water to make it moldable. 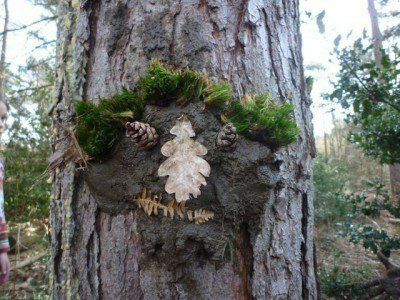 Press lumps of mud onto the trunk of the tree into heads and shapes. This activity can go in all sorts of directions. Ending with mud slinging target practice is a winner! Note: You also probably need a hose at the end of this one. Take some plastic dinosaurs, or other waterproof miniatures, and put them in small containers of water (plastic jars or Tupperware) and freeze them overnight. 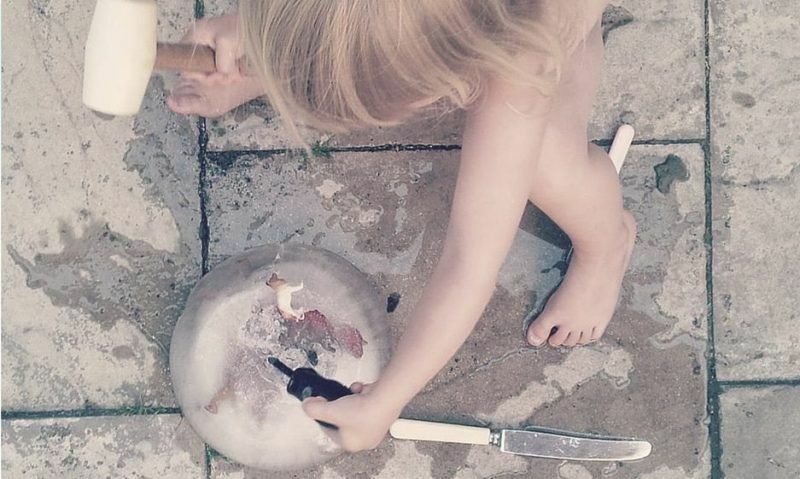 The next day, give your child some tools and utensils and suggest they rescue their dinosaurs from the Ice Age. We have given our young children small butter knives and rocks and they have loved smashing out their little toys. There is a hill fairly local to us that provides the whole community with entertainment. 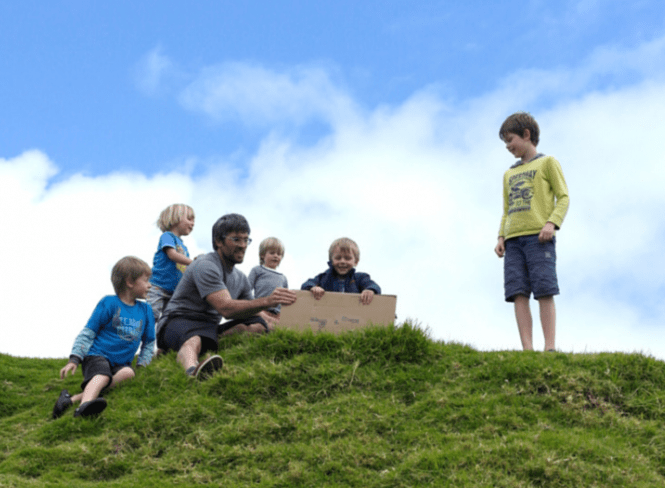 If you turn up on a sunny day, you will hear laughter ringing out as people of all ages sit upon a flattened out cardboard box and slide down the hill. I don’t know if it’s just a local thing, or a New Zealand thing, but I haven’t seen it in any other place! 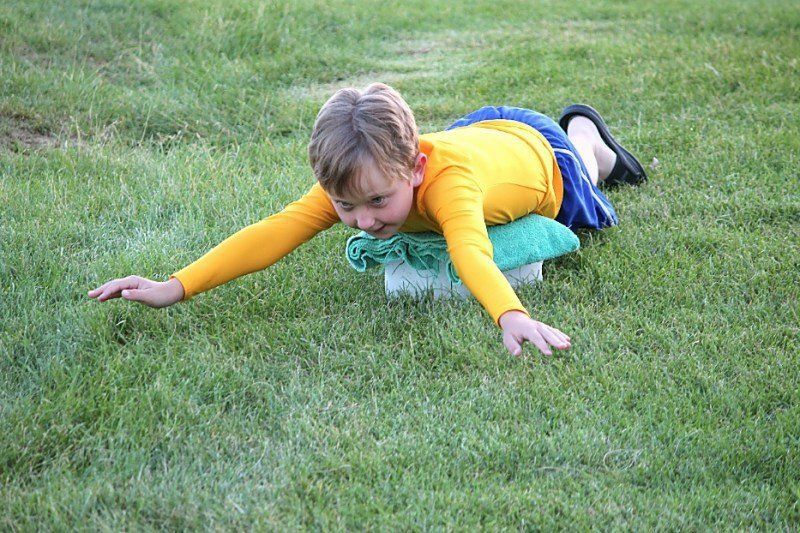 Find a hill of a smooth, steepish gradient and this summer sledding could be yours to enjoy, too! This takes a little bit of preparation from the parent, but once up it is an activity that has the potential to stretch over the whole summer. Take 10 bamboo stakes and dig them into the ground, in a line with eight inches between them. It will look like a gappy fence. Now take a long piece of string and, beginning from the top, tie the string horizontally from the first bamboo stick to the last, weaving in and out of the stakes. Take another piece of string and do the same thing, eight inches below the first string. Do it again until you have completed a grid. This is the frame for your summer sculpture. Weave in weeds, grasses, flowers, sticks, driftwood, shells. Wherever you go this summer bring back natural materials to weave into your sculpture. As the days go by, your empty frame will become a masterpiece. 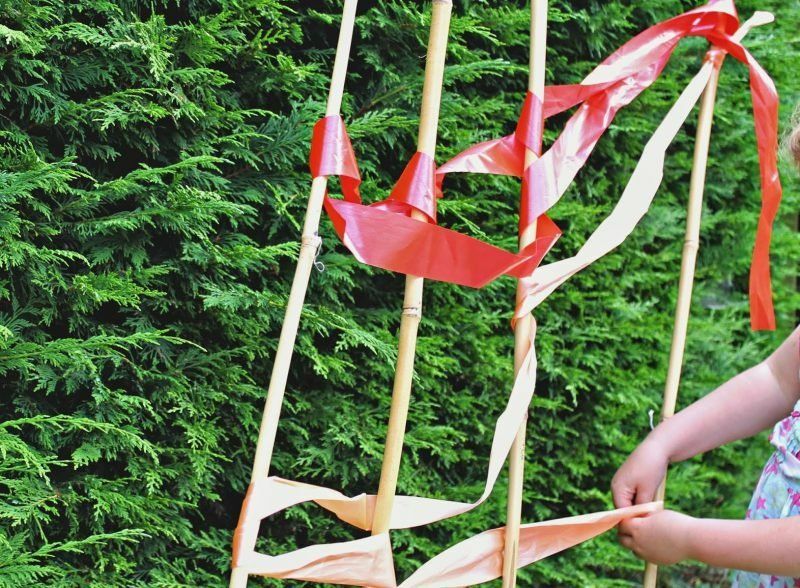 Ideally, your children will take on a sense of ownership over this giant artwork and will spend hours weaving natural treasures in and out of the grid. Sometimes days spent at the beach go by in a whiz, as children just enter the zone of play with all the sensory opportunities available. Other times they need a little help. Try this. Ideally you need a bit of beach with an estuary. 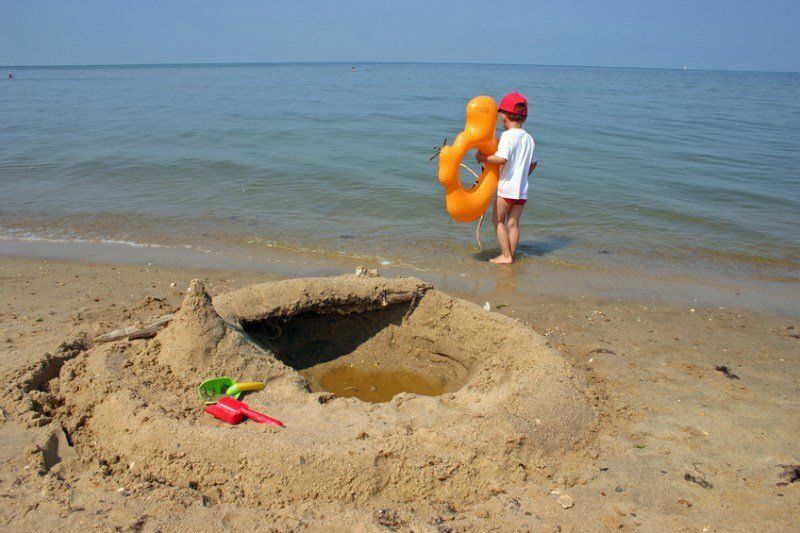 Build a sand castle (* yawn * – wait, wait!!!) that is out of the way of the trickle of water, but downstream from it. Then, take on the role of an attacking enemy and, a few meters up, try to dig channels in the stream to direct the water towards the sandcastle to take it out. Encourage your children to build dams and other channels to keep the flow away from their sandcastle. If you are anything like me, you will get right into this and will enter the zone of play so thoroughly you won’t even want to slip away and leave them to it after a while! Many years ago I ran a youth club. It was the easiest job ever because I let the young‘uns come up with their own activities. One of the things they came up with was the ice slide. It sounds improbable, the sort of thing that only works for people on a Coca-Cola advertisement, but I can tell you it’s legitimate! You do need quite a large freezer – a chest freezer is ideal. And then you need large square Tupperware boxes or the vegetable trays out of the bottom of your fridge. Fill these with water – 3-5 inches- and freeze for at least a day. It needs to be solid. Chuck the slabs of ice in an ice box and head to a hill. It needs to be fairly smooth grass and of moderate gradient. Bring winter gloves and have the kids wear jeans. You’re getting the picture now, aren’t you? Take your slabs to the top of the hill and slide away! Depending on how hot the day is the slabs will last up to an hour, surprisingly, and your children will be SO DELIGHTED with this fun that they won’t need any more entertainment for the rest of the day. One of the things we like to do is write new activities we’ve discovered onto slips of paper and put them into a jar. At the start of each week we’ll pull out an activity and plan to fit it into our week. It keeps things fresh and fun and adds a bit of sparkle. For more outdoor activities check out 80 Outdoor Activities for Rain or Shine. What are some of the things you plan on doing this summer that no one has heard of? We’d love to hear your ideas!